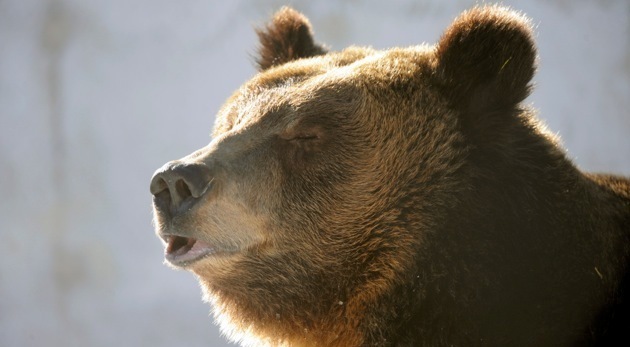 The brown bear (Ursus arctos) can be found across northern Eurasia and North America. It weighs from between 300 to 780 kilograms (660 to 1,700 lb) and its largest subspecies, the Kodiak Bear, rivals the polar bear as the largest member of the bear family. Although the brown bear’s global spread has shrunk, it is listed as a least concern species by the IUCN, with a population of around 200,000 worldwide. But you certainly don’t see one everyday. Given that they spend many days hibernating underground in the winter season, you’ll be pleased to know that Volkswagen Sweden is sponsoring a live-stream of the birth of a litter of bear cubs. Using live video service Bambuser, it’s expected that hundreds of thousands of people will tune in to watch Freja the brown bear in the final few weeks before she gives birth. Animal lovers will also be able to track every minute of the first few months of the young family’s lives via the live broadcast, filmed in a bear reservation in the Swedish town of Orsa. Viewers are also being given the chance to enter a competition to name the cubs and guess the date and time the family will leave their underground den. If you didn’t know, brown bears fatten up on berries during the autumn season in preparation for hibernation. Once they’ve built up sufficient fat reserves to see them through the long Swedish winter, bears then collect moss and twigs to make their hibernation den, often in a disused anthill or at the foot of a large fir tree. Bears usually hibernate from early November to late March/early April. Of course, this isn’t the first time the birth of bear cubs has been broadcast to the online masses. A black bear named Lily gave birth two years in a row in front of a live online audience in northern USA. The North American Bear Center and Whitewolf Entertainment teamed up to carry out some animal research, turning to Verizon Wireless to use its 3G broadband network which covers northern Minnesota.